Award winning artist Tracy Levine is a painter and printmaker who works from her purpose built studio with gallery space in the South Lakes area of Cumbria. Her studio is located in the Area of Outstanding Natural Beauty (AONB) of Arnside and Silverdale, with stunning views over the Kent Estuary to the hills of the Lake District. 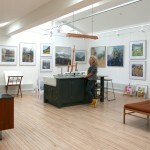 Her work is exhibited widely in galleries around the UK. Tracy has won several awards including first prize in the Cumbria Open 2009, the Peter Tyson painting award at The Lake Artists Annual exhibition 2011 , first prize in Create Longridge 2016 and runner up in the peoples choice award for Cumbrian Artist of the Year 2016. Tracy is an elected member of The Lake Artists Society. Visit the new online Shop to buy reproduction prints and exhibition brochures. The new Tracy Levine studio and gallery space in Arnside is open by prior arrangement ( please phone or email first before travelling as Tracy is often out painting! ). Exhibition on show now. The next OPEN STUDIO WEEKEND will be APRIL Sat 27th & Sun 28th.